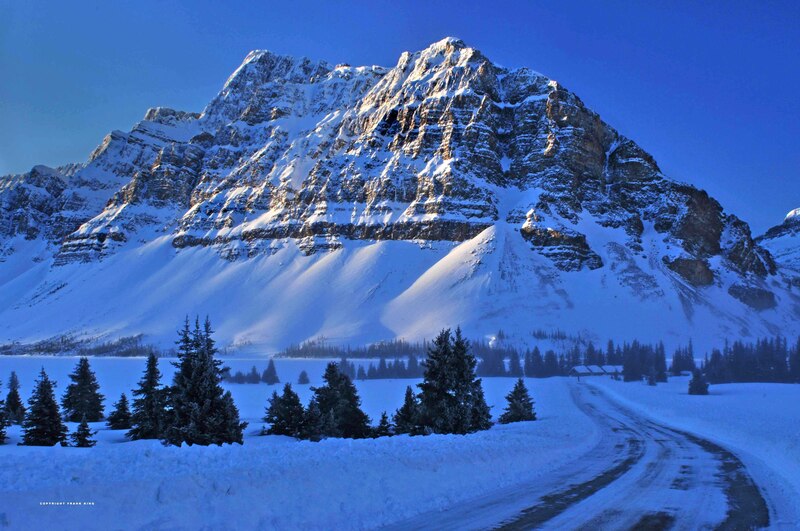 I’m not sure there’s ever a bad time to visit Alberta’s glorious Banff National Park, especially in winter. Unlike other parts of the province, it’s always reliably *winter* in the Rocky Mountains. This photograph was made in late February on the Icefields Parkway, considered by many to be one of the most beautiful drives on this planet. I wish there was snow on the trees, but I think this scene still works well. The peak, by the way, is Crowfoot Mountain. And if you’re wondering why the distant trees seem a bit hazy, it’s because ice fog was drifting through at the time (the temperature was -15C). Thanks for the visit over at my site and can I just say “Wow”. You have some really amazing images. I have you in my reader and I am going to link to your page from my blog! I didn’t notice; are you on Twitter as well? If so, what’s your link there? Beautiful composition, Frank. I love how the smooth snow about a third way up the mountain contrasts sharply with the rugged terrain above it. That White Alpine glow is great! I love that mountain, do you know the name of it?